Perhaps the comedy the least "Italian-style" (by no accident, it was made in Paris) is LA GRANDE ABBUFFATA (THE BIG FEED: 1973) by Marco Ferreri, where the black humor dear to the director attains the maximum effect: to joke about a collective suicide organized by four food-loving friends in a secluded villa, each one dying from the excesses of one last gigantic banquet. The film was the result of a close collaboration between the actors - Marcello Mastroianni, Ugo Tognazzi, Michel Piccoli, Philippe Noiret - and Ferrari, improvising dialogue and action and acapting everything to the true psychological personality of the respective actors, who by no accident kept their own names. Extravagant and terrible, gruesome and scintillating, it is certainly the finest "grotesque" made by an Italian director. 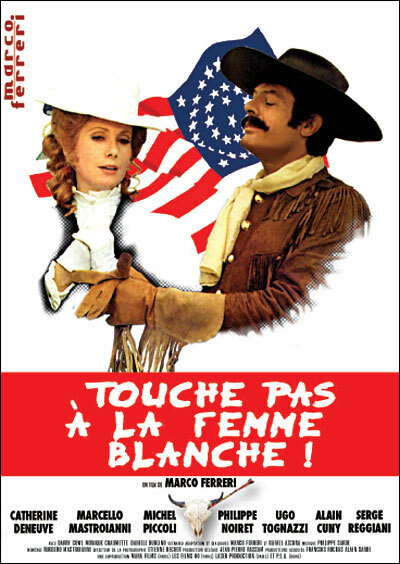 Ferrari was also responsible for another striking caricatural performance by Tognazzi in NON TOCCARE LA DONNA BIANCA (DON'T TOUCH THE WHITE WOMAN), a sort of exacerbated, sophomoric but often irresistible parody of film Westerns and in particular those based on the defeat of General Custer, shot in Paris in 1974 in the "hole" left in the center of town by the destruction of Les Halles, the old general markets. The natural pit, in the context of a modern-day Paris with its normal, swirling traffic, becomes the bizarre set of this historical reconstruction played for laughs, with Tognazzi in the role of a teacherous redskin, Mastroianni of a blood-thirsty, puritanical and health-nutty Custer, Michel Piccoli of a homosexual Buffalo Bill. In LA PROPRIETA NON E PIU UN FURTO (OWNING PROPERTY IS NO LONGER A THEFT: 1973), by Elio Petri and written by Petri and Ugo Pirro, the search for a wholly symbolic, allegorical form of comedy is what makes the film undoubtedly interesting. It revealed a new actor, the skinny, wild-eyed Flavio Bucci, in the role of a neurotic bank clerk who comes to the conclusion that in a society based on legalized theft and exploitation, the only serious form of dissent is to start stealing. He takes as the symbol of the society he hates a rich butcher, Ugo Tognazzi, and starts persecuting him, first by stealing his hat, then a special knife, lastly his girl friend and then planning to clean out his apartment. Too bad the story was not served by a coherent style and frequently remained at the stage of good intentions, merely stated rather than artistically resolved, but Tognazzi's butcher and Bucci's thief were first-rate.